I enjoy a good salad. But I typically don’t go out to Happy Hour to find one. Well friends, that all changed when I tried Blue Olive in NW Portland. 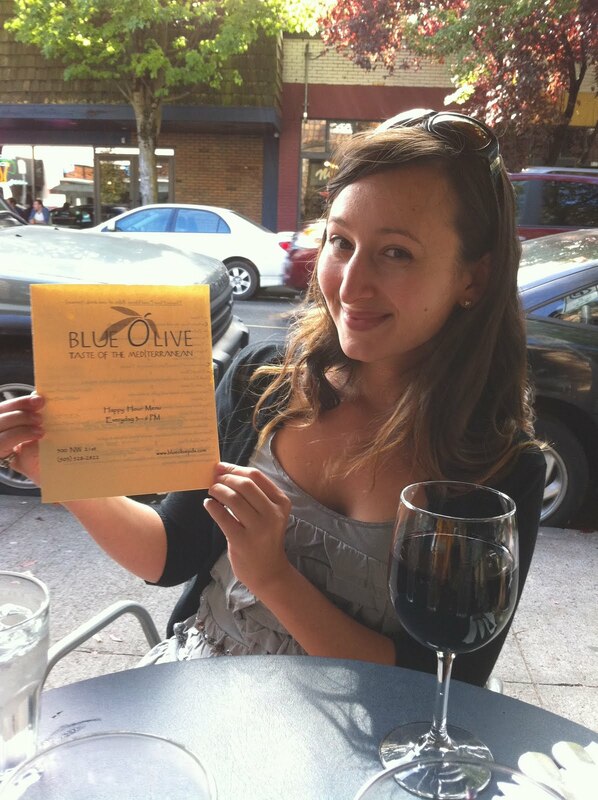 For the last five years, Blue Olive was located on NE Fremont – which I imagine is quite a change from their new spot on NW 21st and Glisan, where Virgo & Pisces sat for the last few years. If you ever visited Virgo & Pisces (or any of the restaurants that came before it), you know that the space itself is terrific. There’s plenty of square footage, a large bar, inside dining, and a strip of outdoor seating. Now there is some method to the madness at Happy Hour here. The circular tables are for Happy Hour visitors, and the square tables are reserved for dinner guests only. Luckily there was one circular table open outside which my friends and I snagged. I absolutely cannot handle sitting inside on a sunny afternoon. 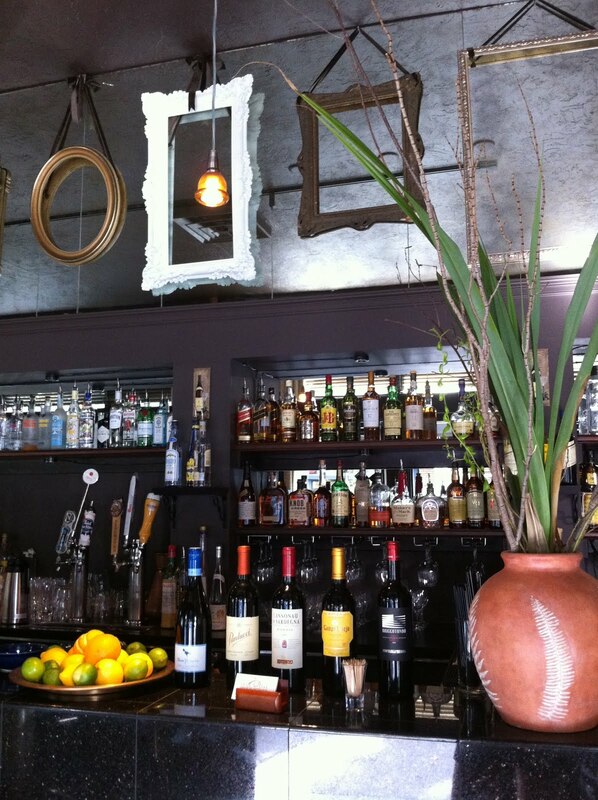 Blue Olive’s Happy Hour runs from 3-6 daily, and includes food and drink specials. Most plates are smaller (think Feta & Olives, Lentil Soup and Humus) and I’d definitely recommend ordering more than one dish. We shared the Dip Sampler Plate ($6), which included a bowl of Humus, Baba Ghanouj and Tzatziki and a basket of Pita Bread. Natalie (who was my freshman year roommate at college and has remained one of my best friends) ordered the Garlic Prawns ($5) and the Mediterranean Salad ($4). Her boyfriend KC ordered the Mediterranean Burger and fries ($5). I also ordered the Garlic Prawns thinking that would be enough. – and then ordered the salad after I tasted Natalie’s. KC had a few pints of Ninkasi on Happy Hour for $3 each. Natalie and I both ordered a glass of wine ($4), which they pour for you at your table straight from the bottle. Unusual right? I’ve worked in restaurants, and normally a glass of wine is measured and poured in the kitchen. But not at Blue Olive evidently. Our waiter poured unmeasured glasses at our table. And he poured large glasses. He knew he was getting a good tip. 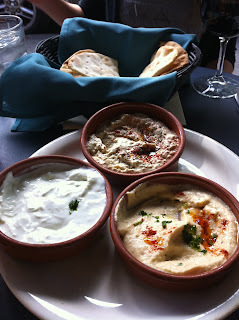 Back to the food: The dips were good; but pretty standard. The pita wasn’t a standout – but when Sam showed up as we were wrapping up(the bridges were up and he had gotten stuck in SE), we ordered a second basket of pita so he could try the dips we hadn’t finished. We ended up having to order the pita off the dinner menu since Happy Hour was just barely over. The bread they brought out was totally and completely different than what they served at Happy Hour – and we all agreed, it was way better. So take note – always order the pita bread from the dinner menu if they’ll let you. The Garlic Shrimp was slightly unimpressive. I mean, I ate all four pieces, don’t get me wrong. But it was nothing to call home about. KC reported that the burger was really good, especially for the price point. Both the meat and fries had clearly been handmade, seasoned uniquely – which I suppose is what you’d expect when you order a hamburger at a Mediterranean restaurant. I asked our waiter about the seasoning. He reported that there was turmeric, parsley and other “magic ingredients.” I liked the description so I didn’t inquire for more. The only disappointment from the burger: a clearly store-bought bun, which took away slightly from the uniqueness of the rest of the dish. And finally, the salad: a must order. A decently-sized bowl filled with lettuce, cucumbers, tomatoes, green peppers, onions, olives, feta cheese, roasted potatoes and a pomegranate vinaigrette dressing. Fresh, tasty and filling. Basically a perfect salad. Aside from food, drinks and seeing friends, one of the things I love about going out to eat is checking out a restaurant or bar’s décor. Some are not so impressive, others are decked out in themed ambiance. The bar at Blue Olive was beautiful – and I had to include a photo here to share. Check out the empty picture frames hanging in front of the mirrored walls. Not sure if this is “Mediterranean themed” or not, but I was in love with the décor regardless, and totally inspired to do some mirrorless frame hanging of my own back in the condo. By the time we had finished our food and second glasses of wine (poured again by our waiter in large portions), the square outside dinner tables had totally filled up, as had the inside dining room tables. In a neighborhood where restaurants often empty out once Happy Hour ends, clearly Blue Hour has put together a recipe of success for the dinner crowd too. But because I only ordered Happy Hour, I can only leave you with two words: Mediterranean Salad.